Before: Older apartments often come with quirks, especially with plumbing. In Lori’s 1930 co-op apartment in Brooklyn, one of those quirks materialized as a two-foot square platform that elevated the toilet by three inches. “It was protruding into the small room,” said Lori. To make the space more open, the platform needed to go. As did the dark blue faux marble tiles, which made the bathroom seem heavy. A vanity also needed to be retired. “It was an awful, dark, scratched up wood that we temporarily painted,” said Lori. Plus, it didn’t provide much storage. The newly renovated look leaned on bright whites with a patterned floor tile to add some excitement. 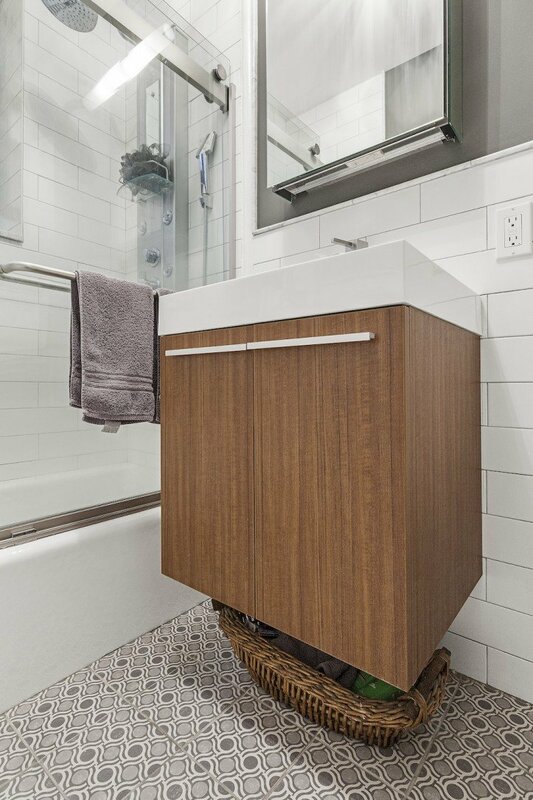 The floating wooden vanity offers a warm pop of color as well as storage, but when Lori first saw it in the new space, it looked bigger than she had hoped. Her Sweeten contractor had another practical fix for that, moving it two inches lower down the wall. “That made it much less obtrusive and we were really happy with it after,” she said. Bonus: Lori had not decided on a general contractor yet when she spoke with Miranda in client services at Sweeten about who would be a good match for her project. Miranda described the previous projects of the Sweeten contractor Lori ultimately picked. She also saw a Sweeten blog post on a previous project. “It was great to have someone to talk to behind an online service,” she said. Style finds: Floor tile: Natucer. Wall tile: Daltile. Vanity, sink, faucet and “Alto” medicine cabinet: Fresca. Toilet, tub, and tub door: Kohler. Hardware, paper holder, and robe hooks: Moen. Shower tower: Art of Bath. Vanity light: George Kovacs-Saber. Ceiling light: Quoizel. Thank you, Lori, for sharing your renovated bathroom with us! A corner sink was the perfect solution to make this small bath feel spacious. The post An Odd Bathroom Finds New Solutions appeared first on Sweeten Blog.